Malteros are the porters who transport luggage and goods between the border of the US and Mexico. Working with a group of maleteros in 2005, artist Mark Bradford collaborated on a system of maps and signs that placed the marginalized work of the unofficial maleteros alongside that of the sanctioned labor of policemen and taxi drivers. 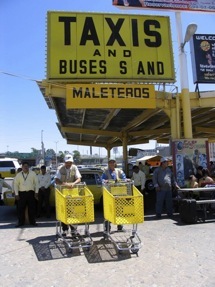 Along with the map, the collaboration resulted in new stations for the maleteros to work out of and store their carts, as well as the creation of a large sign that reads â€œMALETEROSâ€ under the taxi and buses sign. The signs provide visibility for the maleteros as well as demarcated stations for facilitating business and storing carts.